Commissioned as part of the New Sites-New Fields Landscape Research Project at the Leitrim Sculpture Centre, Manorhamilton, Co Leitrim. 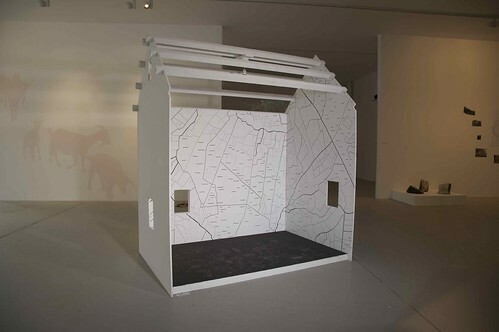 This work centred upon an examination of the idea of place as expressed through vernacular traditions and explored the web of relationships that are revealed through human habitation patterns and landscape. The focus of the work was primarily on the traditional vernacular house form and its surrounds as area of settlement, shelter, home, and realm of dream. It explored the relevance of such houses within the contemporary landscape. The landscape intervention took place in Teach Sheáin Mhic Dhiarmada, a National Monument in the care of the Office of Public Works and the birthplace of Seán Mac Diarmada, one of the signatories of the 1916 Proclamation who was executed during that revolutionary struggle. 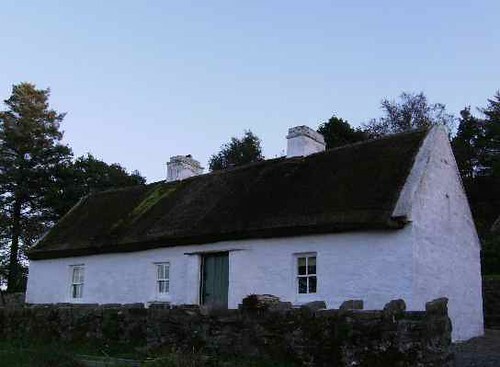 Its custodians describe this classic vernacular cottage as a “national shrine” less for its political legacy than for its architectural expression of life in rural Ireland from the late19th to mid 20th century and of a harmonious relationship to its environment. The patterns of the surrounding fields seem to have shaped the patterns and customs of life within the house and the internal lives of its occupants. The inner and outer worlds must have been deeply entwined. 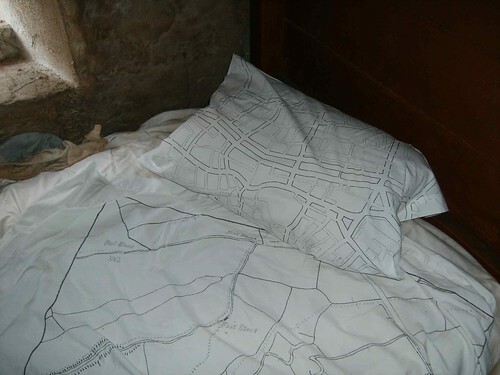 To express this symbiosis, maps of the surrounding townland were drawn on the bed linen of the house. On what might have been young Seán Mac Diarmada’s pillow was drawn a map of a wider world. 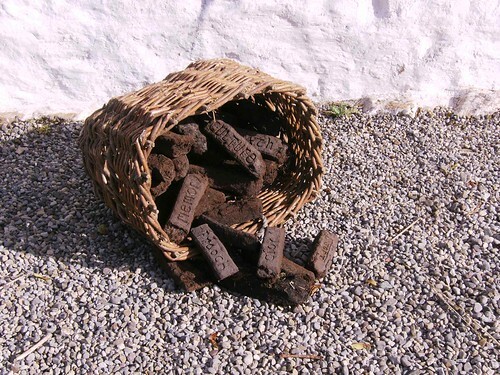 In Corranmore , Laghty Barr, there now stand seven houses where stood thirty not long ago; a thriving community stitched together by custom and shared values. One of these customs was “rambling”. By night the young would ramble to “céilí” in the cottage of their choice. Those with a radio were particularly prized but all doors were open. To awaken a memory of this sense of community and celebration of shared experience a gathering was organized within the house with the aim of reinvigorating the place and allowing it to be experienced as a living building. The theme of openness – to environment and community- was echoed in the gallery installation. Here a house form was deconstructed and its relationship to its environment left exposed. This work explored a different sense of openness, one created through abandonment. There was no adequate shelter in its past. It might be Teach Mhic Diarmada , the hero’s house, as ruin. Neither installation was an exercise in nostalgia but sought to posit a question as to our fundamental relationship to our surroundings and histories. The traditional house form as a vibrant expression of a people’s relationship to landscape has effectively vanished and with it a whole series of cultural relationships. Does this same disappearance reflect a widespread dissociation from the natural world, from the historical secrets of local landscapes, of the inner life from the outer world? How is that dissociation expressed and what might its cultural consequences be?